Working with reclaimed materials is a great way to save money and help the environment. Building with Secondhand Stuff shows you how to upcycle and work with found materials to create unique pieces for your home and garden. This granite-slab kitchen island will be an elegant addition to any kitchen. Countertops are some of the best uses for reclaimed stone slabs. Not only are the sizes and shapes of many slabs ideal for this application, some stone surfaces were countertops in their previous incarnation. The combination of a luxurious appearance, outstanding durability, and resistance to wear and tear (including physical abuse and water) make all kinds of stone ideal for food preparation surfaces in the kitchen. Although we’ve chosen to describe adding a reclaimed stone top surface to a rolling cabinet that will serve as a mobile kitchen island, the same techniques described here can be used to adapt reclaimed stone as countertops over built-in cabinetry. Attaching the top works the same in both cases, with masonry screws holding the stone surface to the bottom structure. In both cases you may need to cut the stone you’ve selected to the correct size, or to make room for a sink or other feature, such as a cooktop. How you finish the stone surface is a matter both of what type of stone it is and what type of appearance you’re after. Choose a slab of slate and it’s possible you can seal it without polishing for a matte black or gray surface. Opt for granite, and you’ll probably want to seal and finish it in a high-gloss coating that is not only protective, but makes the intrinsically interesting grain really pop. Keep in mind, though, that many types of stone need to be maintained if used as kitchen surfaces. Both granite and marble may need to be resealed every 6 to 12 months, depending on how you’ve sealed them to begin with, and how they were finished. Ultimately, though, no matter which type of reclaimed stone or finish you choose, the surface is bound to be an opulent addition to the kitchen. There is a richness to true stone—especially antique stone—that can’t really be replicated in synthetic materials. Go to the effort of reclaiming a stone surface and integrating it into your kitchen’s design, and you’ve added an unrivaled accent for a fraction of what it would cost new. Remove the cabinet drawers, shelves, and all hardware for cleaning. If the hardware is in poor condition, or you find it unstylish, replace it. Check the cabinet’s structure to determine if it needs reinforcement to support the stone top. Prepare the cabinet for painting or finishing. Clean, sand, or just brush off rust or loose paint as necessary. Wipe down the cabinet with mineral spirits and a rag before you begin painting it. Modify the cabinet as necessary. Here, metal shelf brackets are being attached to the sides to create a mounting surface for the countertop. The brackets add decorative appeal. Use decorative hex-head bolts to attach the brackets. If your cabinet doesn’t have a back panel, add one. Prime the cabinet carcass, doors, and drawer fronts with metal primer. You’ll get the best results if you use a sprayer, such as this HVLP sprayer, in a well-ventilated workroom. Make sure the primer goes on as a thin, even coat. Paint the cabinet. For best results, apply several thin coats and use a paint formulated for metal (if your cabinet is metal). Sand lightly between coats to remove any imperfections, according to the paint manufacturer’s instructions. Install casters on the bottom of the cabinet carcass so that it can be moved around the kitchen and repositioned as needed. Alternatively, you can make the cabinet into a kitchen island by anchoring it to the floor. Complete the cabinet. Reattach the hardware or install new. Add decorative drawer pulls for an eye-catching accent. Reinstall the cabinet doors, making sure that they close correctly and hang level and plumb. Clean up and rehabilitate the salvaged countertop. Here, two 12″-wide strips of 1½” thick granite are seamed together to create the countertop. Before installation, the top surface and edges of each strip are polished with an angle grinder equipped with a diamond wheel. Wear a respirator, eye and ear protection, and work in a well-ventilated area. Position the countertop strip on the cabinet with the overhangs roughly equal at the sides. Apply a bead of clear polyurethane sealant to the mating edge of the first strip. Place the second strip on the cabinet and press it firmly against the first. Use bar or pipe clamps to hold the strips together. Anchor the countertop to the mounting brackets. Use a masonry bit to drill holes in the underside of the countertop to accept masonry screws. Apply a few drops of epoxy into each screw hole before fastening the brackets to the countertops. Small projects such as this cabinet top are ideal uses of reclaimed stone. Although you may sometimes find large sections of reclaimed granite or marble that will provide all the surface area you need for an entire kitchen’s worth of countertops, more often than not, you’ll be faced with smaller sections and mismatched pieces. You can use these for islands, or incorporate them as an accent section as part of a longer run of countertops in a complementary material such as Corian. You can also cut and polish pieces to make large cutting boards or incredibly beautiful sideboard hot plate trivets. From Craig’s List, your basement, and estate sales, you can salvage what you need to upcycle all kinds of cool things. You can build tables, install vintage hardwood floors and salvaged windows, mason reclaimed stone walls, and do much more using free or very inexpensive, high-quality, reconditioned materials. You’ll encounter opportunities to upcycle usable building materials everywhere. 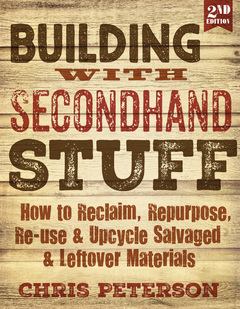 By using Building with Secondhand Stuff, 2nd edition, good judgment, and a few salvage tricks, you can take advantage of these chances to gather free (or nearly free) project supplies and put them to work in your house. This second edition of the best-selling book includes new projects such as a pallet chair, pallet table, chalkboard message door, door-backed island, and a reclaimed window greenhouse.